Good writing always gets you ahead. 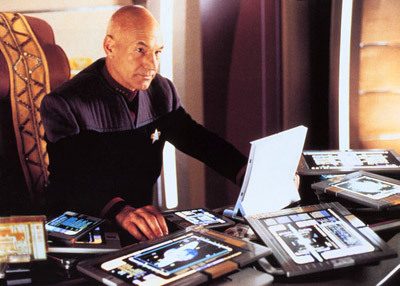 Even Picard knows that if you don’t have good writing and editing, things fall behind when you have a lot of editing to do. I’ve been job searching again, as my last contract ended about a month ago. I’ve had some ups and downs in the last month, to say the least, but finding the next gig is always a priority (even though I said I was going to take the summer off). I’m still doing a few hours here and there of freelancing, but it’s not paying the bills, so the search goes on. But as I’m working on coming up with a curriculum for the technical editing course I’m slated to teach at NJIT this fall, and following a phone interview with a recruiter for another job, it occurs to me that good writing and editing has always been a mainstay in my career, even before I got involved in technical communications. The first job I had that involved writing was as a consumer affairs representative for the company that makes Arm & Hammer products. Part of the job was not only taking notes about the consumer calls, but also answering written inquiries. Now remember, this is in the days before the web, so phone calls and letters were all we had, but they kept us busy! My department had several form letters that we could use for the most common correspondence we’d get, but now and then, we’d have to customize one of those form letters, or write a totally new letter. I was often told, as a kid fresh out of college, that I was a good writer, and my letters usually didn’t need as many tweaks as the others in my group. Fast forward to the job that launched me into looking at technical communications. I was working as an application specialist at a huge philanthropy/non-profit. My department used instructional design techniques and technical editing to review grant application processes, and help those writing the grant applications and review processes to turn those paper processes into digital processes. I’d have to check for grammar, sentence structure, make sure that instructions were clear to elicit the responses that were expected from those using the content management system. I didn’t know the terms “instructional design” or “technical editing” or “content management” at the time, but figured them out later when I got laid off from that position, and decided to go back to school to do…something. I was often praised by my manager that I understood grammar and knew how to make the correct edits better than my predecessor, and we bonded over Oxford commas. And to think, I wasn’t even an English major! But I always liked learning languages and I always did well with grammar lessons, so it seemed natural to me. Fast forward again to now. Many of the jobs that I’ve applied to in the past few years or so have involved my ability to write and edit. Some of those jobs were earned, and I had to show that I could write and edit, and I did successfully. I had done very well in graduate school in my technical editing class, and now I’m working on revamping the curriculum for the same class which I’m about to teach this fall. These days, it seems like good writing and editing is going by the wayside. Digital writers depend too much on spell checker and grammar checker to be caught by their word processing or editing software, when that’s only a tool to help catch the obvious mistakes. I don’t know how many times I’ve checked and double-checked a document and found mistakes that spell checker did not find. Those tools on common software can’t find sentence structure phrases that would be unfamiliar to a machine doing translation to find turns of phrase that aren’t found in other languages. As I continue my search for the next big thing I’ll be doing, I’m realizing that my attention to grammar and language has been a boon for my career, and if I didn’t have that, I wouldn’t be where I am today. It’s something that’s so simple and starts at a very young age while still in elementary school. For those who make arguments about evolving language and grammar, and advocate that emoji are part of written language, I disagree. Straightforward language, but written and spoken, has always helped me in my career, and I suspect that it will continue to help me going forward. Technical writing and technical communication beseeches that we use a solid foundation of good language skills, as it is a requirement for those in the field to do our job properly. If you usually don’t do much authoring or editing, it would be worth taking a refresher course. I think the STC sometimes provides great ones online. In these days of digital writing when no one is properly checking content, it’s worth the time and effort to make sure that you have the skills to do what software or a machine sometimes can’t do. This entry was posted in Uncategorized and tagged digital literacy, editing, STC, tech comm, tech comm software, TechCommGeekMom, Technical communication, technical communications, technical editing, technical writing. Bookmark the permalink.